Investors might have used Wednesday's rally as a chance to rest up so they could get back to what they've been doing best lately: selling. The Nasdaq lead the carnage today with a 3.1% loss. 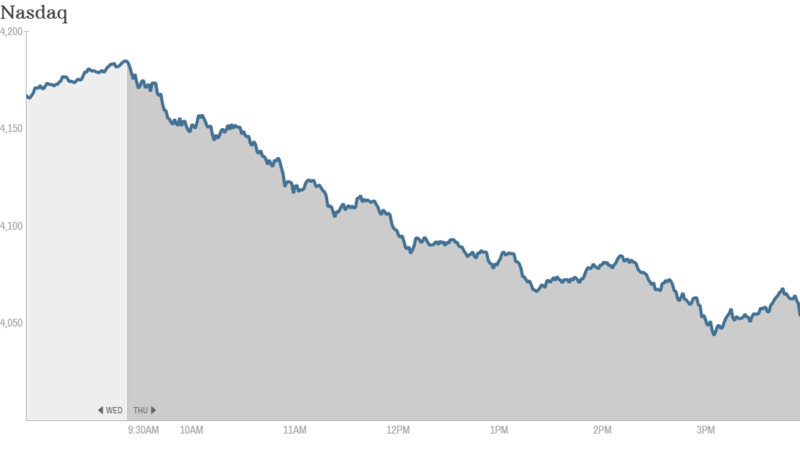 It's fairly uncommon for the Nasdaq to have a triple-digit fall, but today it was down nearly 130 points. Trading screens were awash in red as investors once again dumped technology and biotechnology stocks. The Dow finished down 1.6% and had its third biggest point loss of the year. The S&P 500 was off 2%. Only a handful of stocks in the S&P 500 list ended in positive territory today, and most of those barely nudged up. Craig Johnson, senior technical research strategist at Piper Jaffray said today's plunge will set-up for an "interesting Friday". "No one wants to get caught long going into the weekend so I think people will be sitting on their hands tomorrow. There will be a lack of buyers and we'll drift lower," he predicted. Marquee Nasdaq names like Google (GOOG), Amazon.com (AMZN), Yahoo (YHOO) all finished down more than 4%. Facebook (FB) fell over 5% after gaining Wednesday. Part of this is likely due to a correction in momentum stocks, but concerns about the Heartbleed bug are also playing a role. The biotech sector was part of the Nasdaq bleed as well. Biogen Idec (BIIB), Celgene (CELG), and Vertex (VRTX) fell between 4% and 6%. Gilead Sciences (GILD) plunged more than 7%. On StockTwits, the $QQQ PowerShares Nasdaq ETF board was busy. buyusbeer said,"I love the term 'dead cat bounce' and the visual I get. But I hate it when it actually happens!" kamwjm seemed to throw up his hands,"I'm just going to ignore all this and bury my head in some yardwork... it's a beautiful day here!" Jim Paulsen, Chief Investment Strategist at Wells Capital Management, thinks the body slam in stocks today is mainly emotional. "It's human nature really. When the momentum stocks ran up and then started to selloff, people wanted to unload but they didn't want to do it in a downturn. Instead, they waited until they saw strength so they could feel better about themselves and they sold today. Yesterday we were up, so people wanted to unload today," he said. But Paulsen thinks this is a buying opportunity and that stocks will continue to go up. His reasoning? He sees underlying economic growth "north of 3%" because of what he calls "an ongoing story of economic strength." Better economic news this morning wasn't enough to lift the mood. Jobless claims fell to a 7-year low last week, however economists note that there's often a lot of variation this time of year that might not accurately reflect the true health of the jobs market. In corporate news, eBay (EBAY) and activist investor Carl Icahn have buried that hatchet, but the stock is tradid lower. The two sides reached a deal to end a contentious proxy battle. Icahn will withdraw his proposal to spinoff eBay's PayPal unit and relent on his request for two board seats. 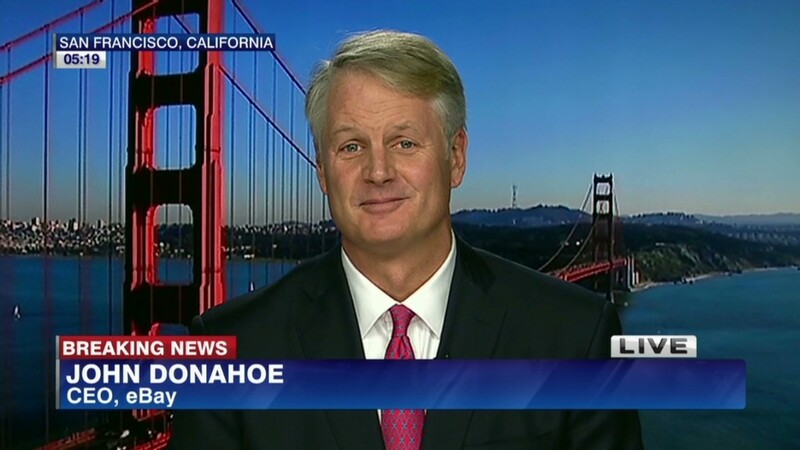 For its part, eBay has agreed to appoint David Dorman as an independent director. Dorman is currently chairman of CVS Caremark (CVS). None of this has helped eBay's stock, which was down over 3%. Even among the losers, some got him more than others. Imperva (IMPV) had a particularly rough day, plunging more than 40% today. The data security company warning about weaker than expected first quarter numbers. On StockTwits, mdcooper said, "$IMPV news is spreading to other IT security players in the market. It reported falling demand." He's right. Other cybersecurity stocks like FireEye (FEYE), Palo Alto Networks (PANW), Qualys (QLYS), and Fortinet (FTNT) also slid. Retailers are in the midst of reporting their earnings. Rite Aid (RAD)shares surged after the drugstore chain reported better than expected fourth quarter results. It was one of the few positive stories today, ending up over 8%. In contrast, shares in retailer Bed Bath & Beyond (BBBY) tumbled after the company warned that it expects first quarter earnings to miss expectations. It was off more than 6%. On StockTwits, Rdurga had a theory about the mechanics in Bed Bath & Beyond's (BBBY) marketplace,"$JCP may be getting back market share from $BBBY. $JCP has to get customers back from $M, $SHLD, $WMT, $ROST." The biggest IPO to hit Wall Street so far this year started trading today when Ally Financial (ALLY) went public. It traded below its $25 offering price for most of the day before ending flat. The old GM finance arm that was bailed out by the government doesn't seem to be exciting investors much. Major European markets closed mostly lower with the FTSE finishing slightly higher. Investors across Europe are watching as Greece returns to the bond market for the first time in more than four years. The country is looking to raise money by issuing five-year bonds, and demand is reported to be strong. Greece was shut out of international markets in 2010 when its economy collapsed, leading to two rescues by the European Union and International Monetary Fund. Meanwhile, in Asia, nearly all the major stock markets ended with gains. The Hang Seng in Hong Kong shot up by 1.5% and the Shanghai Composite added 1.4%.